Serving hunters and their gun dogs since 1984. Do you own a retriever? Would you like to see your dog become an even better hunting companion? Do you believe a good retriever is an important wildlife conservation tool for the hunter? Do you find training books helpful, but wish you could find someone to train with? 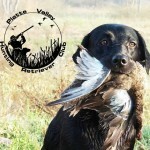 Do you wish you could send your dog to an unseen downed bird? 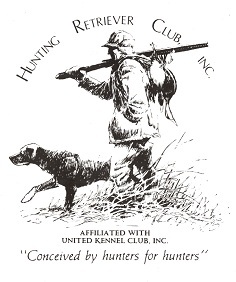 Would you like to be part of a national organization, with local affiliated Hunting Retriever Clubs, that brings hunters together to help each other train their hunting dogs and tests the dogs in realistic hunting situations to check their training progress? If so, read on, the Hunting Retriever Club, Inc. could be just the ticket. HRC is affiliated with The United Kennel Club, Inc., Kalamazoo, MI, who caries the registry for the Inc. A volunteer organization, HRC is democratically governed by a Board of Directors and an elected Executive Committee. Membership in HRC is open to persons regardless of age, race, religion, creed or national origin. The HRC is family-oriented offering outdoor fun and fellowship to its participants. Participation by women and children is strongly encouraged and wholesome atmosphere is maintained at all times. While most HRC members own retrieving breeds, participation in events is open to those with other versatile hunting dog breeds that can do the work. HRC maintains its common sense, hunting realism in testing Hunting retrievers. There are five utility-based (not age) categories that the dogs may enter in the HRC Tests: Started, Seasoned, Finished, Grand and upland. Unlike field trials, these are not competitive 1st, 2nd, and 3rd place events, but tests where all dogs are judged pass/fail against a “Hunting Standard”. These are events that are great fun where everyone can root for the other person’s dog and help each other with their training. The judges must be experienced Hunters and must pass HRC administered tests, apprentice as judges, have gun safety training, attend judging seminars, have handled and passed a dog in the category that they are judging and meet other HRC requirements. Good ‘Hunting-oriented’ judges are the keys to having tests with Hunting Realism. The tests are directly related to hunting the retriever in the field for waterfowl and upland game. Unlike field trial, the bird throwers and any guns in the field are NOT exposed and dressed in whit, but are hidden as in real hunting situations and dressed in appropriate hunting clothing. The handler must wear camouflaged or other hunting attire. Gallery members must also wear appropriate camouflaged or other hunting attire due to creating distractions for the working dog. In the three upper levels, the Handler handles the shotgun (firing blanks), and works his/her dog from a blind or perhaps a boat, and may be required to quarter the dog in a pheasant or quail field. Seasoned, Finished and Grand dog, Handlers must direct their dogs to birds the dog did not see fall (a blind). HRC stresses actual ‘Hunting realism’ and ‘gun safety’ in the hunting tests. The Grand Hunting Tests are held twice a year and are open only to those retrievers that have attained their Hunting Retriever Championship title. While there are over 1,800 Hunting Retriever Champions, there are only 85 Grand Hunting Retriever Champions. The Grand tests are considered the ‘Retriever Superbowl’. There are currently 93 Hunting Retriever Clubs in the United States and Canada and there are over 7,000 active HRC Members. The substantial membership of the HRC are devout outdoors men, women, and young people. 17% of HRC members are under 30 years of age, 38% are age 30-40, and 45% are over 40. Our diverse membership includes responsible hunting individuals from all walks of life. 98% of the members of HRC own dogs. 37% own more than three dogs. As the dogs associated in this program are by the vast majority, trained and handled by their owners, they are more than just hunting dogs, but companions and members of the family. HRC Clubs hold over 150 licensed Hunt Tests each year with an average of 73 retrievers and 182 persons participating per event. Of these people participating, 66% are male, 34% are female and 10% will be under the age of 18. On average, each of HRC’s 7,000+ members spend 6.3 days per year at a Licensed Hunt Test. 65% of HRC members drive over 1,000 miles per year to hunt or attend hunt tests. Members of local Clubs typically get together to train, for monthly meetings, hear presentation, hold fun hunts and Licensed Hunt Tests. Most clubs have training grounds for their members. HRC success comes from active members. Most local Clubs have newsletters that help keep members informed and in touch, while the UKC publishes an excellent bimonthly publication for HRC, the HUNTING RETRIEVER magazine. This magazine keeps members up to date on upcoming HRC events and news, results of licensed hunts, includes training articles by nationally know columnists, regional information, product updates and much more.